For the second, it soon became obvious to both my wife and I that we needed subtitles turned on to understand what in the heck the characters were talking about. Thank goodness we saw it on DVD and not in the theater, otherwise we would have been totally lost. The combination of accents, pirate speak, and low voices mixed with loud music and sound effects made it very difficult to understand conversations without subtitles, and that detracted from the feel of the film. I don't remember having this problem with the first film. And the whole Davy Jones plot was kind of confusing anyway. And so now I've just watched the third Pirates film, Pirates of the Caribbean - At World's End . It was instantly clear that once again we would need the subtitles to understand 90% of what was being said. Why are the voices so low? Sometimes subtitles would pop up when we wouldn't even hear anyone speaking! I would have been pissed had I paid to see this in the theater. But thanks to the wonders of DVD subtitles, I was able to understand at least some of what was going on, and the things I didn't understand was due to a confusing plot. Okay, so at the end of the second film, we see our main character, Captain Jack Sparrow, get strapped to a ship by our female lead Elizabeth Swann so that he will be dragged down to Davy Jones' Locker by the giant Krakken monster. In order to tie him to the ship, Elizabeth kisses Sparrow to distract him, and her love, Will Turner, spies this kiss. So he now thinks she loves Captain Jack, and thus his heart is broken. I mention all this because there seems to be a lot of betrayal in this third film, and I think a lot of it stems from this. Betrayal in stories is tricky... it can work as a shocking twist, but it can also work to confuse and/or cause your audience to despise the characters they are supposed to be rooting for. And that's what happened to me in this film. All three of the main protagonists seem to be @ssholes, so I end up not caring what happens to any of them. And I don't know if they are truly betraying their comrades, or just pretending to, which twists up my mind trying to figure out what the intentions are. Meanwhile, this movie is HUGE. It introduces a lot of new characters, most who don't really seem to be all that important, such as the Brethern Court of pirate lords. Okay, you have a bunch of pirate lords, that's fine, so why do I need to be introduced to each one of them individually? They don't really do anything in the movie but take a vote. Big whoop. That was a big waste of 20 minutes. Why not spend that time on the giant Krakken monster? Oh yeah, they killed him. Not in an epic battle, but in a sentence mentioning that it was killed. There was a scene near the beginning where Jack was interacting with a bunch of himselves. He was on his ship, the Black Pearl, and he was captaining an entire crew composed of Jack Sparrows. It was quickly apparently that he was simply hallucinating, but even so I didn't understand the point of the scene. Why was it there? Maybe for comedic relief? If so, it wasn't that funny. I learned from watching the extra features on the disc that they had a good time making that scene. Well that's nice, but it doesn't make it any more interesting to watch. There's more of my time wasted. I think you can see where I'm going with all this. This film was dull. I loved the costumes, the acting and special effects were all pretty good, but it was still just very plain. By the end of the movie, I didn't care about any of the characters, and then I'm subjected to a huge, long battle between two pirate ships. And as with the first movie, the human pirates are fighting undead pirates that can't be killed, so it's not all that exciting. And it goes on FOREVER. There is no sense of danger. I don't expect any of the characters to die, but even if they do, who cares? They can just be brought back to life like Barbossa and Jack Sparrow were. What I enjoyed more than the movie were the extra features. You get to see Keith Richards behind the scenes, and the making of the multiple-jack sequence (the making-of was much more interesting than the actual sequence). There are bloopers, deleted scenes (which definitely should have been deleted... I think 30-45 minutes more of this film should have been deleted), behind-the-scenes with Chow Yun-Fat, and other various features. Bottom line here is do not buy this before renting it. The 2-disc DVD and 75GB Blu-ray 2-disc® come packed with an immense array of bonus material including bloopers and exclusive BD-Java enhanced features for the high-definition release! Walt Disney Studios Home Entertainment presents “Pirates of the Caribbean: At World’s End” like you’ve never experienced it before on Disney DVD and stunning high-definition Blu-ray Disc® loaded with an armada of bonus materials. Johnny Depp, Orlando Bloom, Keira Nightley and Geoffrey Rush lead a stellar cast in the biggest, most thrilling installment of the blockbuster franchise, filled with spectacular visual effects, exotic locales and breathtaking action. “Pirates of the Caribbean: At World’s End” arrives in time for the holidays on multiple platforms including 2-disc DVD and 2-disc 75GB Blu-ray sets featuring hours of extra material highlighted by bloopers and extensive behind-the-scenes content – plus the Blu-ray exclusive Enter the Maelstrom: a BD-Java feature that takes Blu-ray interactivity to an astounding new level! Produced by Jerry Bruckheimer and Directed by Gore Verbinski and with global box office to date of over $946 million, “Pirates of the Caribbean: At World’s End catapulted to become the #1 global box office hit of 2007 to date with over $946 million generated at the box office, arrives December 4 on multiple platforms, including a 2-disc DVD for the SRP of $34.99, 2-disc 75GB Blu-ray for the SRP of $35.99, and single-disc DVD for the SRP of $29.99. Captain Jack Sparrow returns in a massively entertaining epic adventure beyond the very ends of the earth in the #1 worldwide box office phenomenon of 2007. Join Elizabeth, Will, and Captain Barbossa as they navigate through treacherous lands, mysterious lore, and supernatural wonders of the Pirate world. Meet the legendary pirate lords as they prepare for a titanic clash with the ruthless Lord Beckett and Davy Jones’ fearsome Flying Dutchman. The “Pirates of the Caribbean: At World’s End” 2-disc Disney DVD set immerses users in hours of behind-the-scenes content and pirate lore from the four corners of the earth. Features include a behind-the-scenes documentary called Keith & the Captain; Anatomy of a Scene: The Maelstrom; The Tale of the Many Jacks; Hoist the Colours; Masters of Design; Inside the Brethren Court; The World of Chow Yun Fat; The Pirate Maestro: The Music of Hans Zimmer; Bloopers of the Caribbean; and much, much more! Relive the breathtaking action and mind-boggling special effects in glorious high-definition detail with the “Pirates of the Caribbean: At World’s End” Blu-ray 2-disc release. The Blu-ray Disc high-definition feature film presentation was created from the original digital source files, delivering an unequaled, demo-worthy home viewing experience. Marvel at the wondrous 1080p detail of Davy Jones’ slimy, barnacle-encrusted crew and tremble at the ground-shaking cannonade of ship to ship battles with 7.1 channels surround, 48 kHz, 24-bit uncompressed audio – you’ll swear you smell the gun powder and feel the salty sea-spray splash across your face! 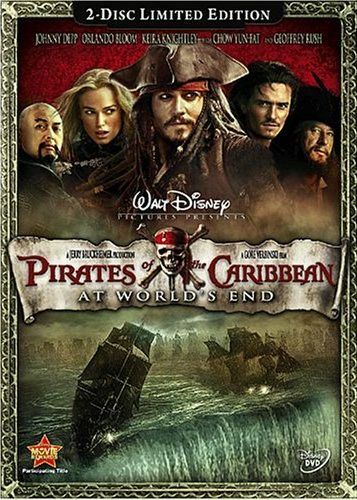 The Blu-ray Disc release includes all of the standard DVD bonus content re-mastered in high-definition, plus exclusive BD-Java enhanced features including Enter the Maelstrom, an extensive interactive look at the climactic sequence of “Pirates of the Caribbean: At World’s End” and the return of the Jolly Roger host, who navigates users through animated menus with state-of-the-art BD-Java enabled artificial intelligence. This scurvy scallywag entertainingly guides you through the pirate waters of your Blu-ray experience, responding to your actions (and inactions) with humorous commentary. Enter the Maelstrom, the exclusive showpiece of the Blu-ray Disc, takes you deep into the perilous whirlpool of the Maelstrom, a sequence of unimaginable scale. The colossal battle between the Black Pearl and the Flying Dutchman stands as one of the most impressive action set pieces in cinema history with its photorealistic blend of live-action footage and computer-aided FX wizardry. Jerry Bruckheimer hosts the BD-Java feature – a one-hour immersive, interactive tour that explores the sequence from stem to stern, covering everything you would want to know and more about this awe-inspiring cinematic achievement. Explore the Palmdale hanger that housed the sets from floor to ceiling seamlessly through an interactive, time-lapse footage interface. In-feature pop-ups and selectable icons appear throughout the time-lapse footage over different areas of the massive set; navigating to each of these reveals multimedia content about how the Maelstrom was created, from set construction to special effects. Discover the Maelstrom on your own, or take a tour of the highlights of the set with Jerry Bruckheimer, who provides optional commentary throughout the feature. Disney and programmed by Panasonic Hollywood Laboratory. Panasonic is a key technology provider for BD-Java or Blu-ray Disc Java, which is the interactive platform supporting advanced content for Blu-ray Disc. BD-Java allows bonus content on Blu-ray Disc titles to be far more sophisticated then bonus content provided by standard definition DVD. Panasonic also handled the film’s AVC video compression (Advanced Video Coding; a digital video codec standard that is noted for achieving very high data compression) direct from digital intermediates as well as menu authoring for Disc 1 of the Blu-ray 2-disc set. Just when he’s needed most, Captain Jack Sparrow (Johnny Depp), that witty and wily charmer of a pirate, is trapped on a sea of sand in Davy Jones’ Locker. In an increasingly shaky alliance, Will Turner (Orlando Bloom), Elizabeth Swann (Keira Knightley) and Captain Barbossa (Geoffrey Rush) begin a desperate quest to find and rescue him. Captain Jack’s the last of the nine Pirate Lords of the Brethren Court who must come together united in one last stand to preserve the freedom-loving pirates’ way of life. From exotic Singapore, to World’s End and beyond, from Shipwreck Island, to a titanic battle, this adventure’s filled with over-the-edge action, irreverent humor and seafaring myth and magic. Everything has led to this twisting, turning, wild swashbuckling ride in this final chapter of the Pirates Of The Caribbean trilogy.